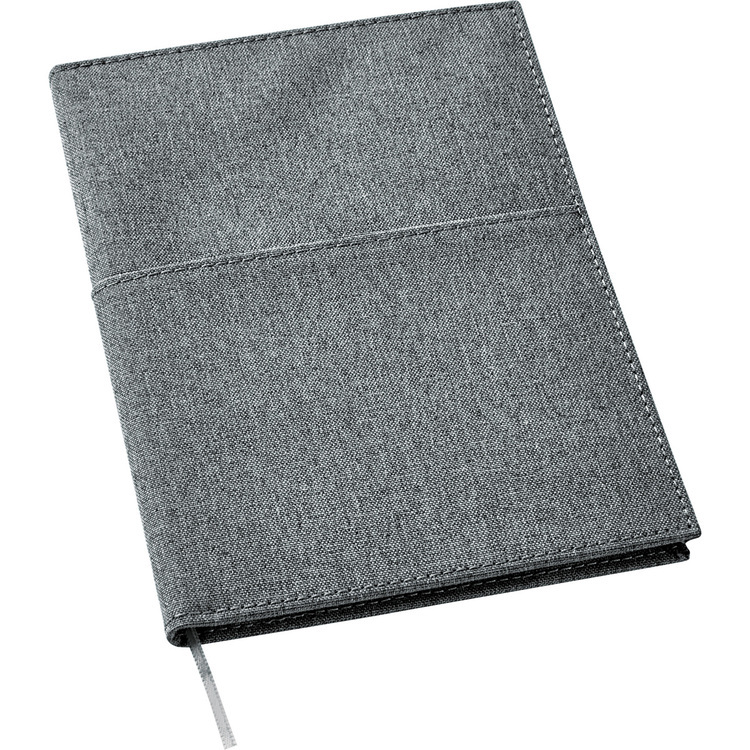 Canvas,refillable notebook with front and back pocket for storing business cards, smartphone, pens,etc. Elastic closure, pen loop and ribbon page marker. 50 sheets of white lined paper. Denim-like, hard bound journal. 80 sheets of white lined paper. 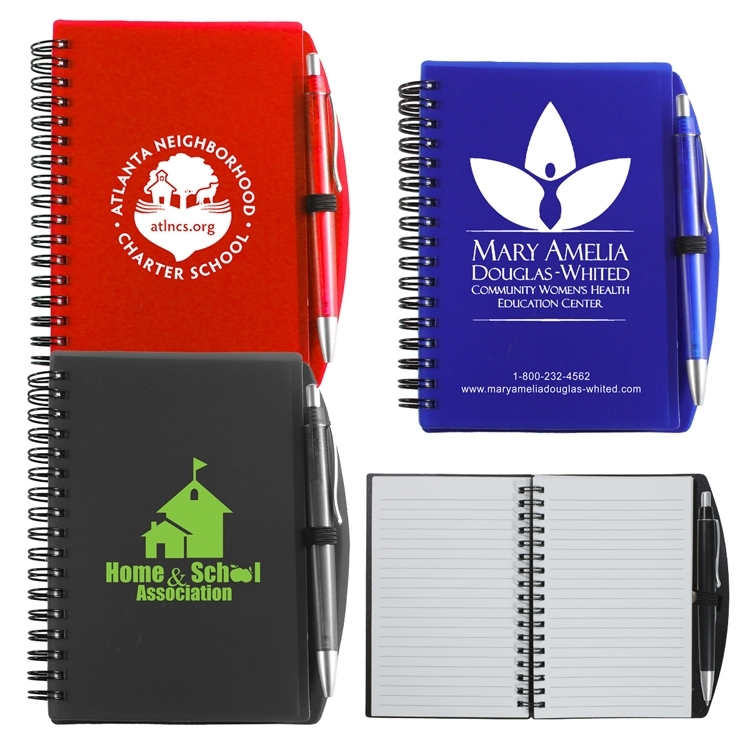 The 3" x 5" Maxx Jotter Notebook is a 30 ruled page, refillable notepad with a business card pocket. 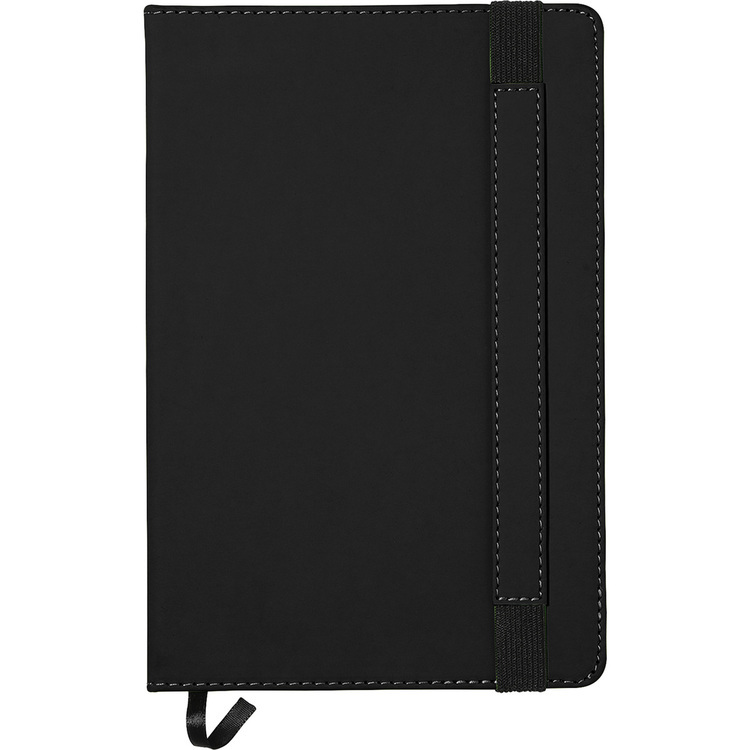 • Made from high-quality leatherette material. 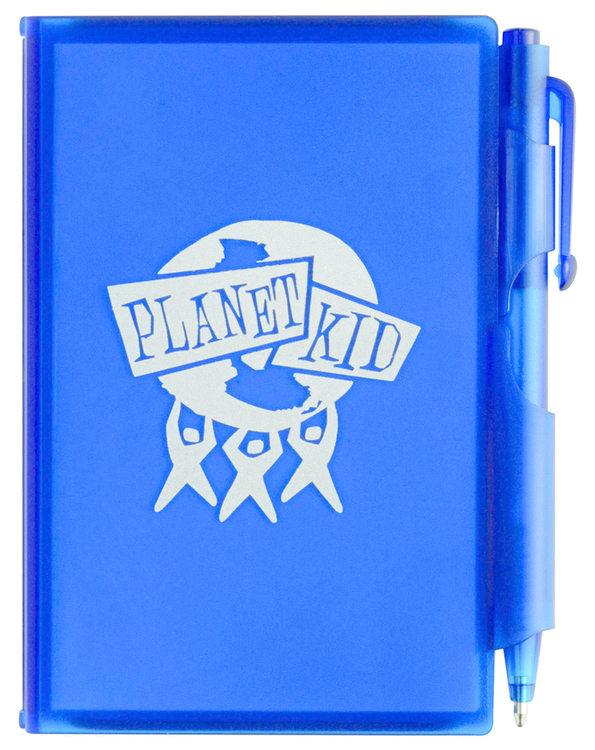 • Perfectly-sized to fit in your back pocket. 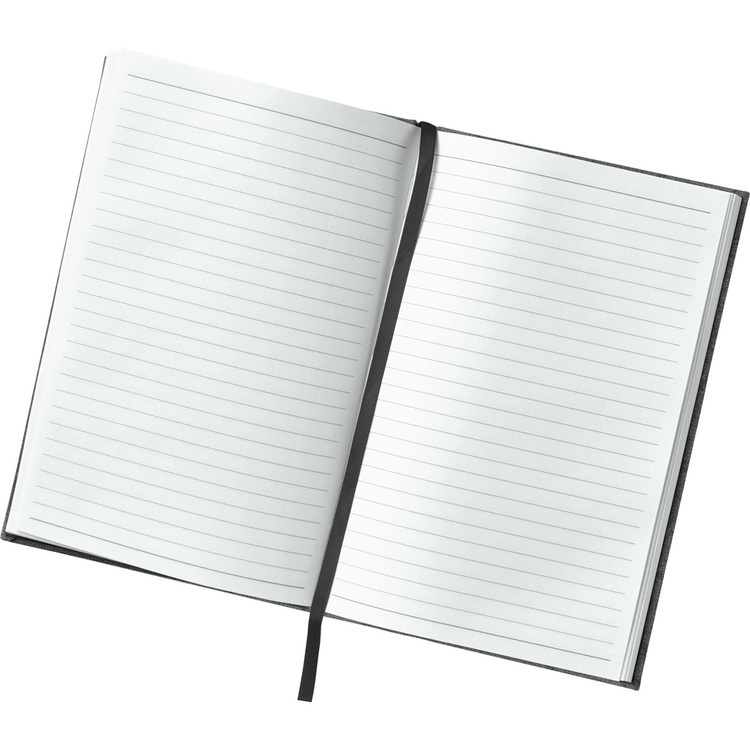 Lined notebook with translucent cover. Zipper pocket on back cover. • Comes with an extra heavy duty cardboard cover made from recycled paper. • Color stripe is made from recyclable, nonwoven material. • Contains 70 pages of recycled paper lined with soy ink. 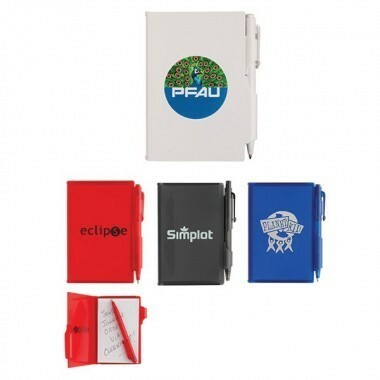 • Includes a black ink pen made from recycled paper and metal ring binding. 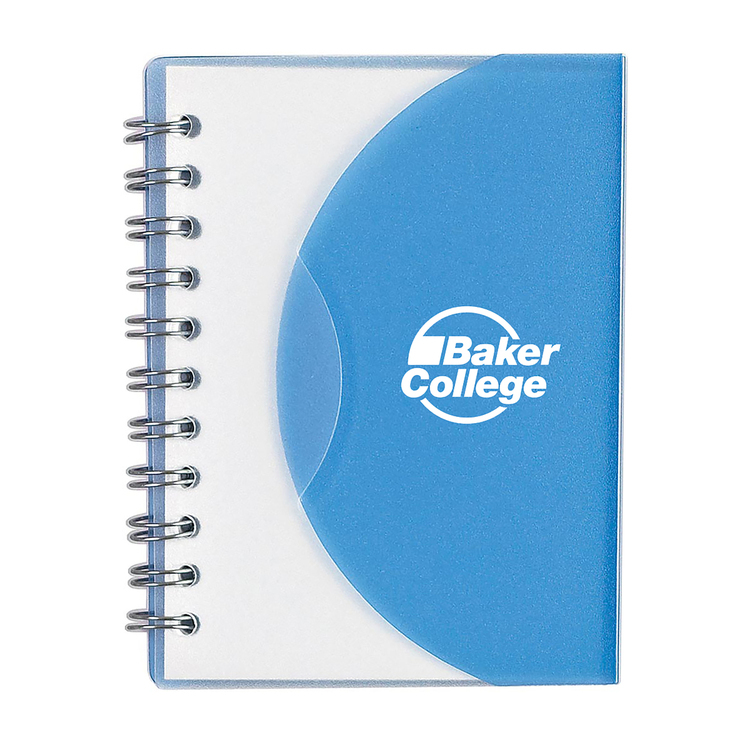 Take notes in this lined paper notebook. 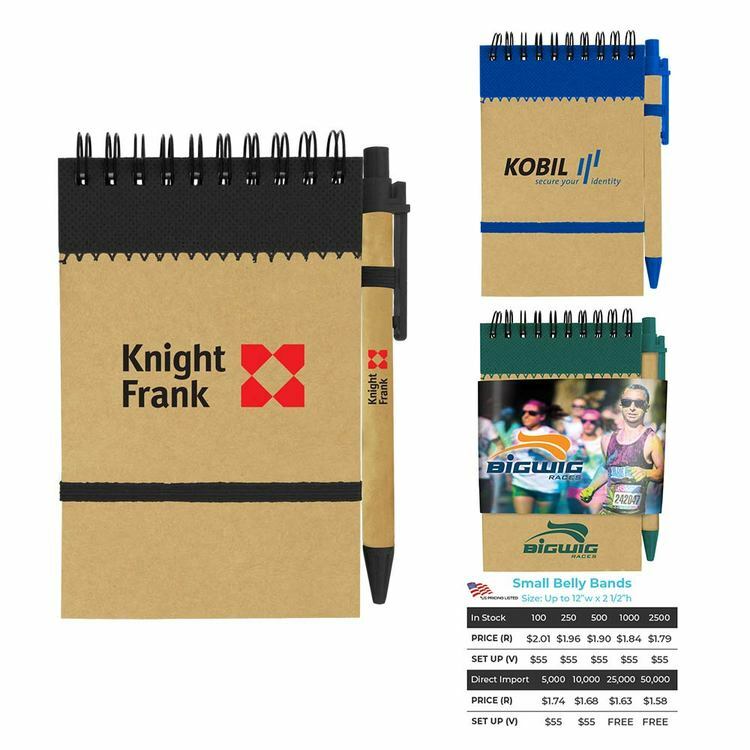 • Comes with a heavy cardboard cover made from recycled paper and black snap closure. 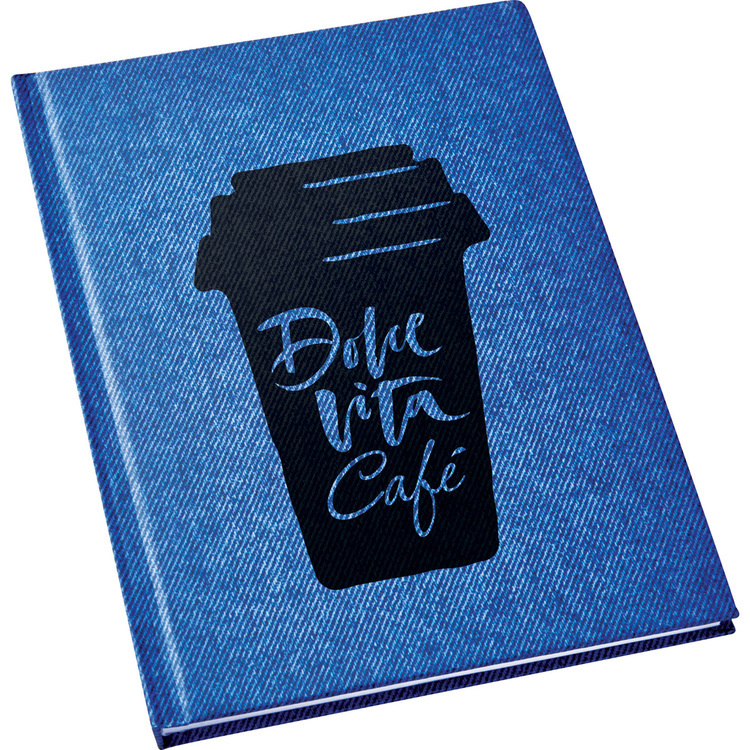 • Contains 70 pages of recycled lined paper lined with soy ink. 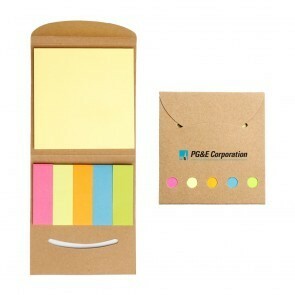 • Includes a recycled black pen, 25 large yellow sticky notes, 25 medium stickynotes and 5 colors of sticky note flags. • Comes with a heavy cardboard cover made from recycled paper. • Comes with 80 unlined pages of recycled blank paper. 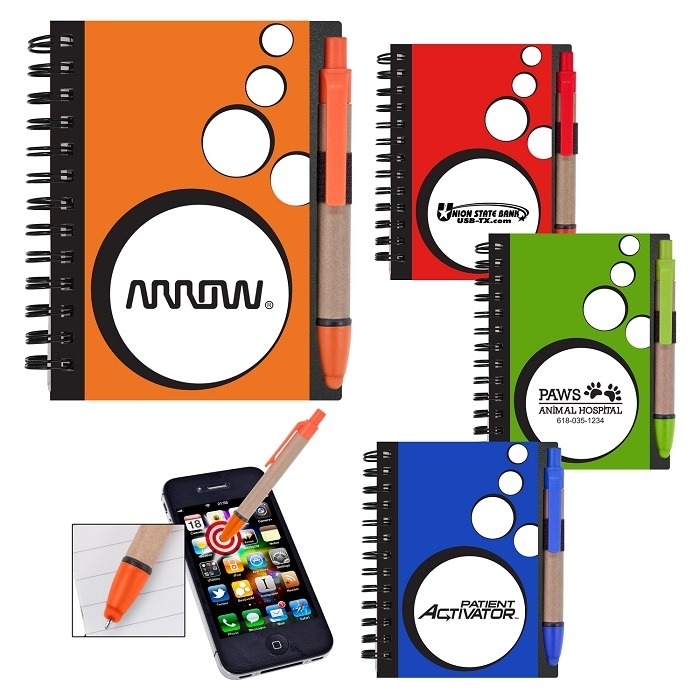 • Includes a black ink pen made from recycled paper. • Item JT100. 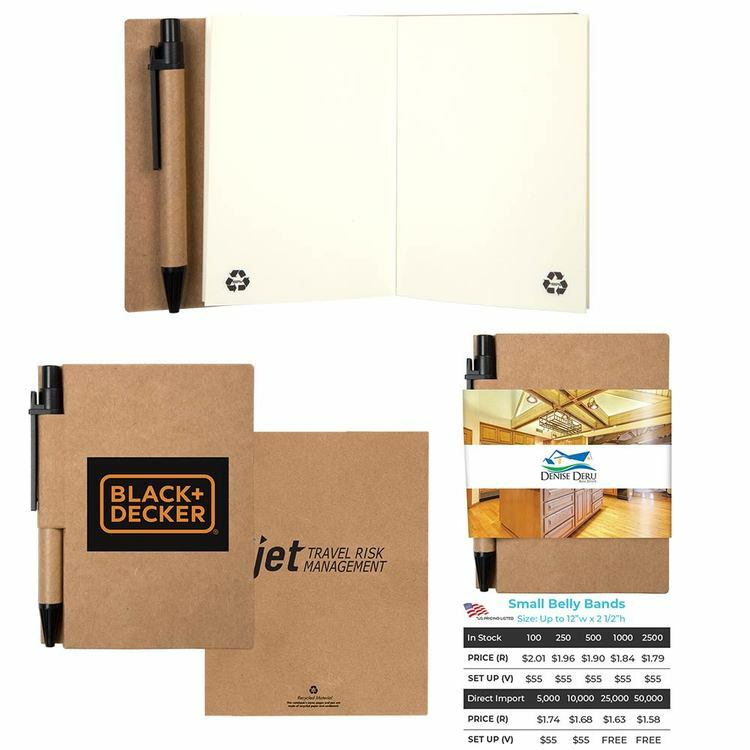 Jotter made from high quality leatherette material, with lined pages. • Item P120. 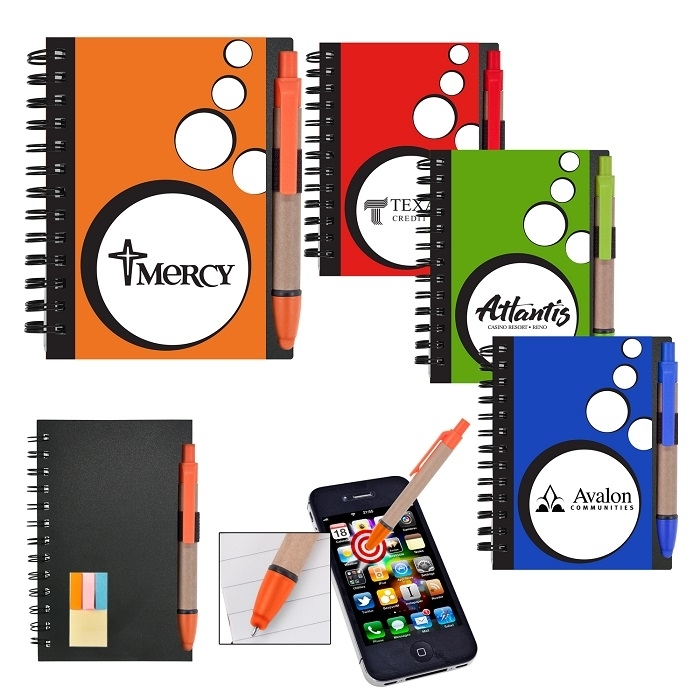 Pen is spring action of rubberized matte finish, with stylus and black ink. 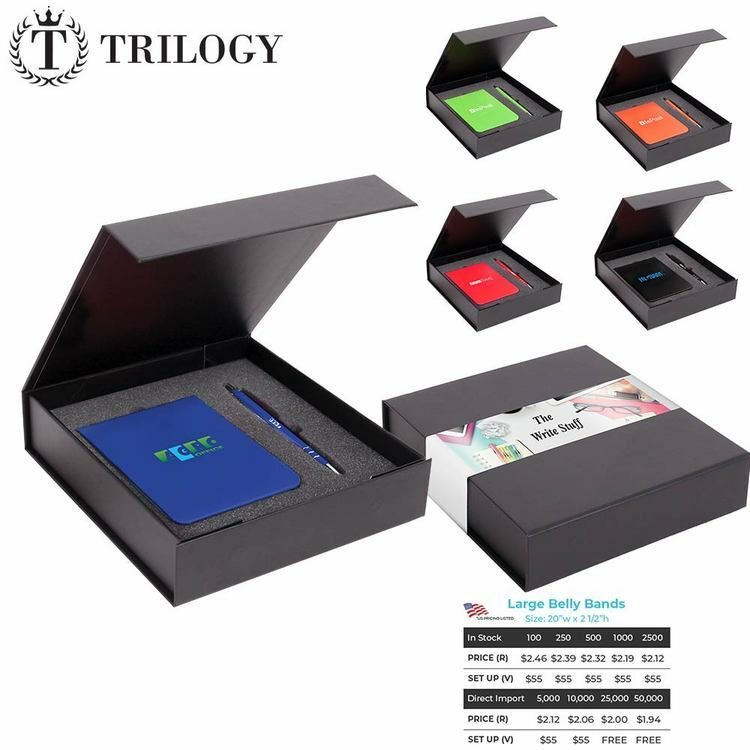 • Jotter includes one color imprint; Pen includes laser engrave. • See individual pages for more detailed product information. 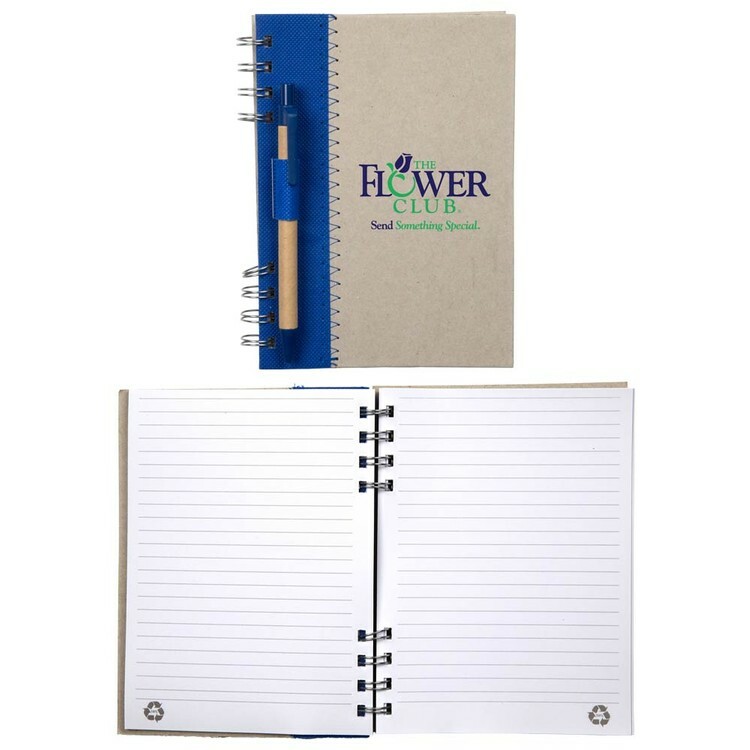 This spiral bound notebook is made from recycled paper. Includes free recycled paper pen. 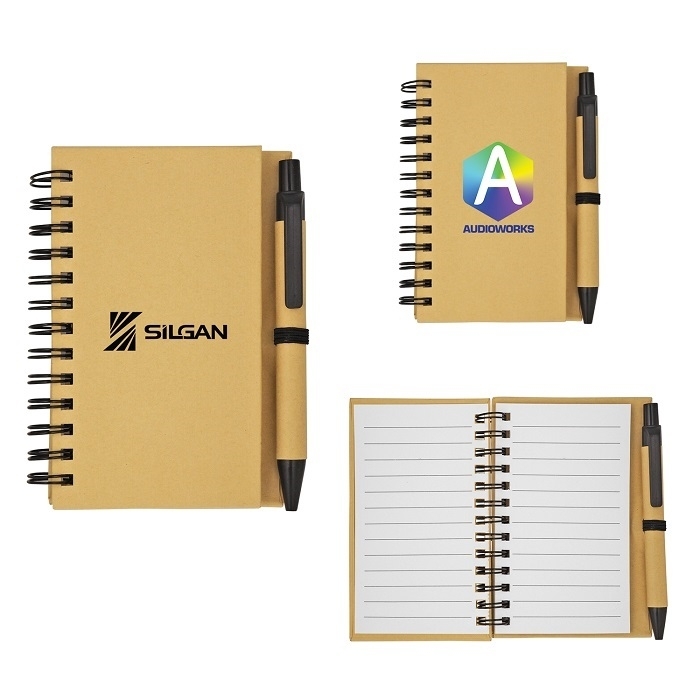 Imprint included on Notebook, see Terms & Conditions for additional imprint charges on pen. 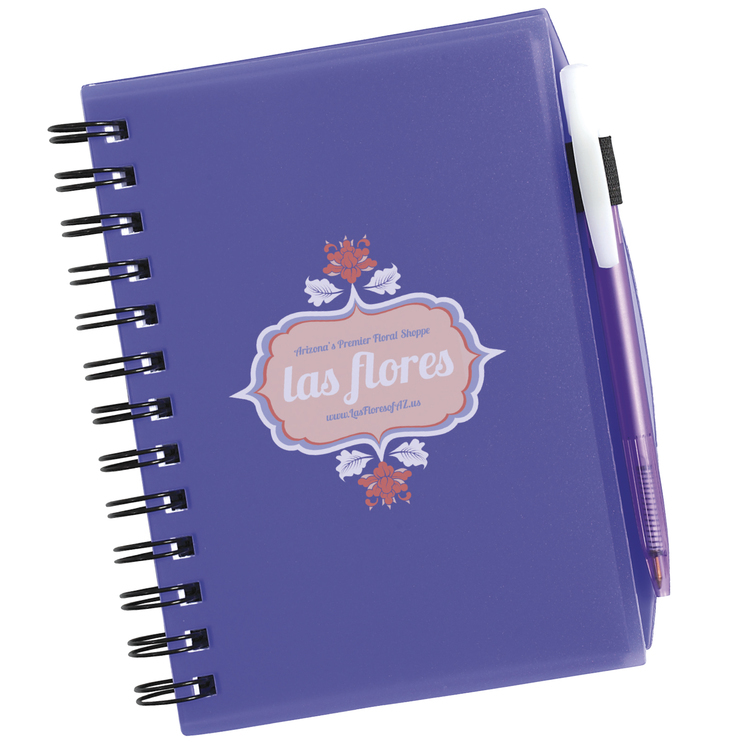 Measures: 3.125" L x 4.75" H.
Great for office or personal use. 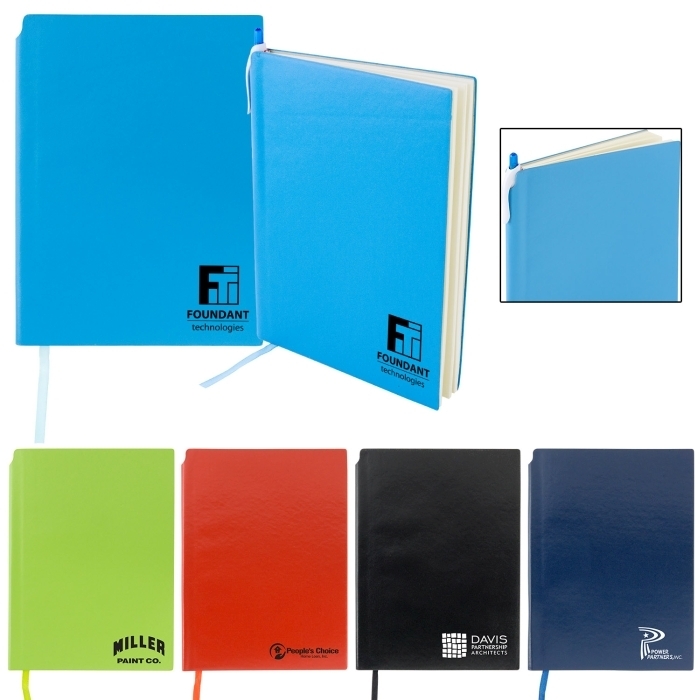 80 Page Lined Notebook, Polypropylene Cover. 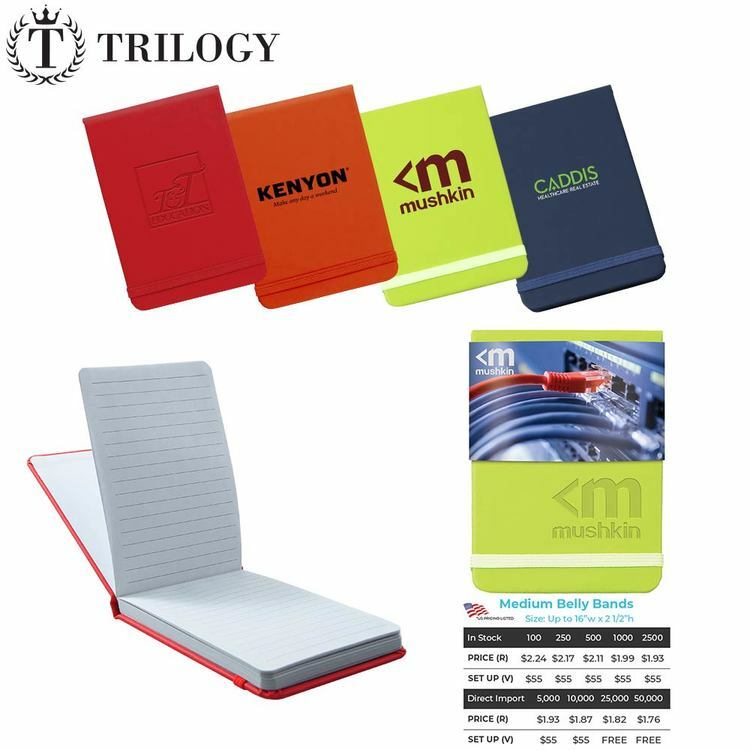 • A note pad with a hard vinyl cover and an elastic band to keep it closed. • Includes approximately 100 sheets of lined paper. 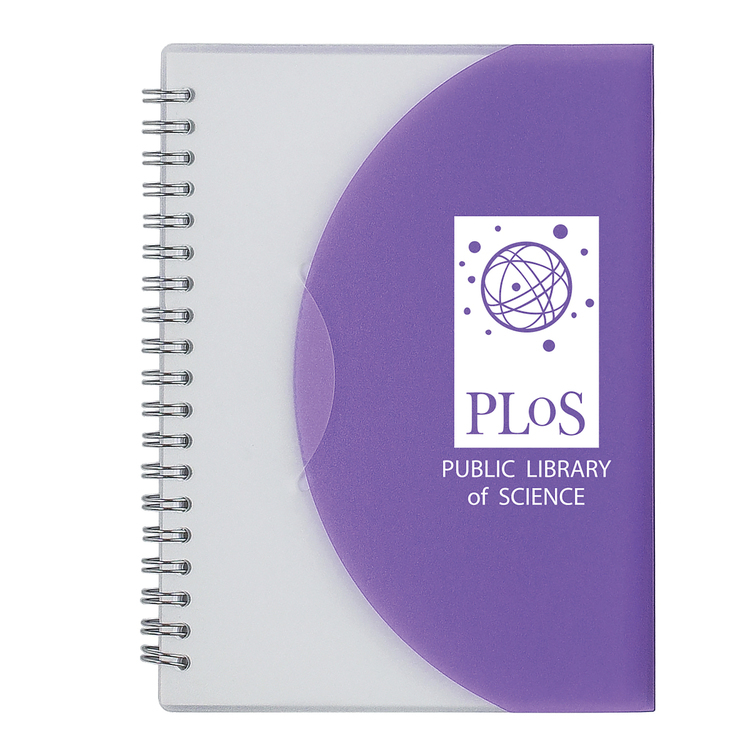 PU, hard bound journal. Color matching ribbon page marker. Elastic pen loop. 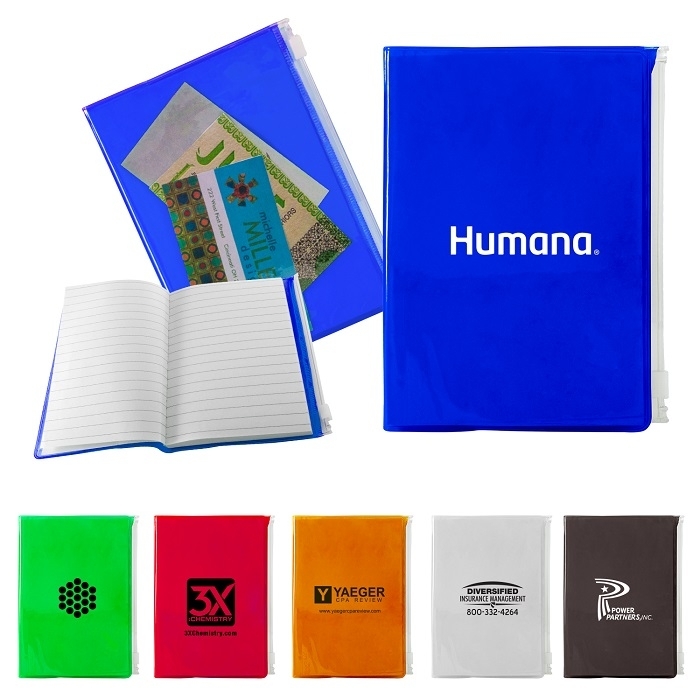 80 sheets of cream lined pages.Expandable back document pocket. 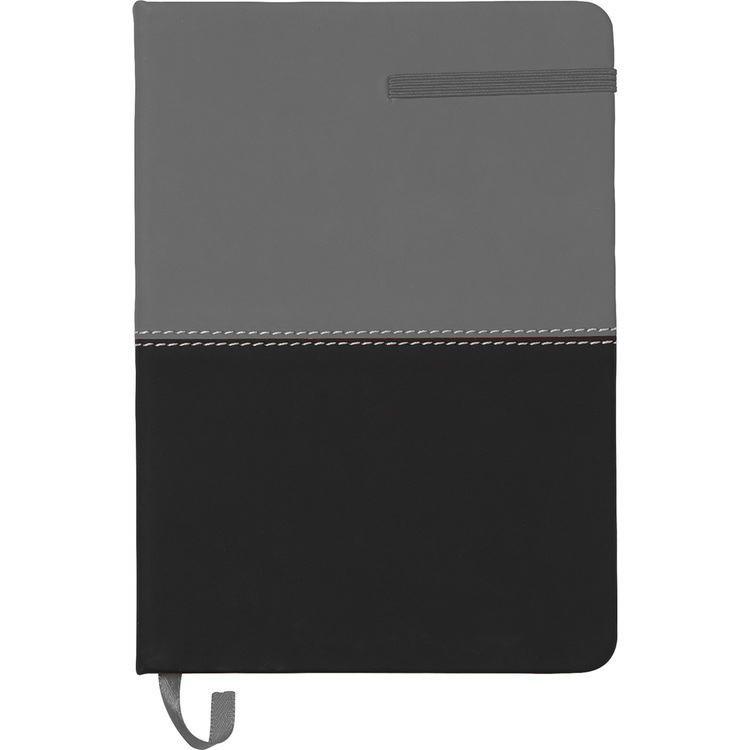 PU color block, hard bound journal. 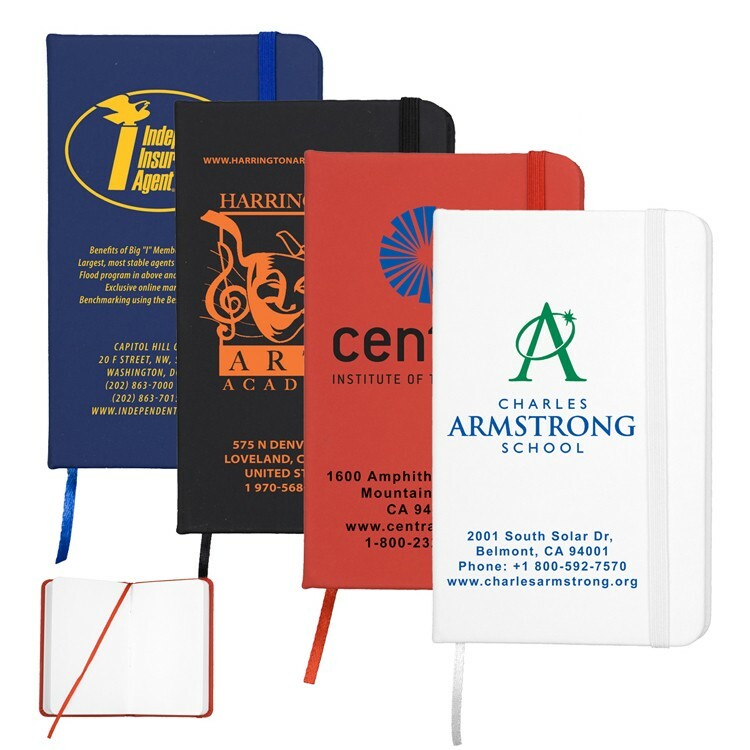 Color matching ribbon page marker. 80 sheets of white lined pages. Elastic closure. 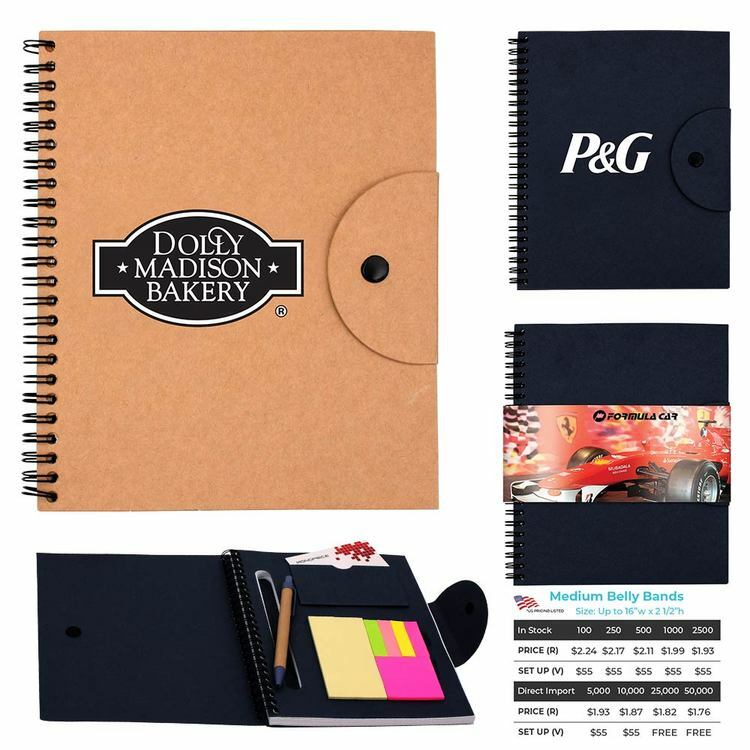 Canvas, hard bound journal with vinyl pocket for storing business cards. 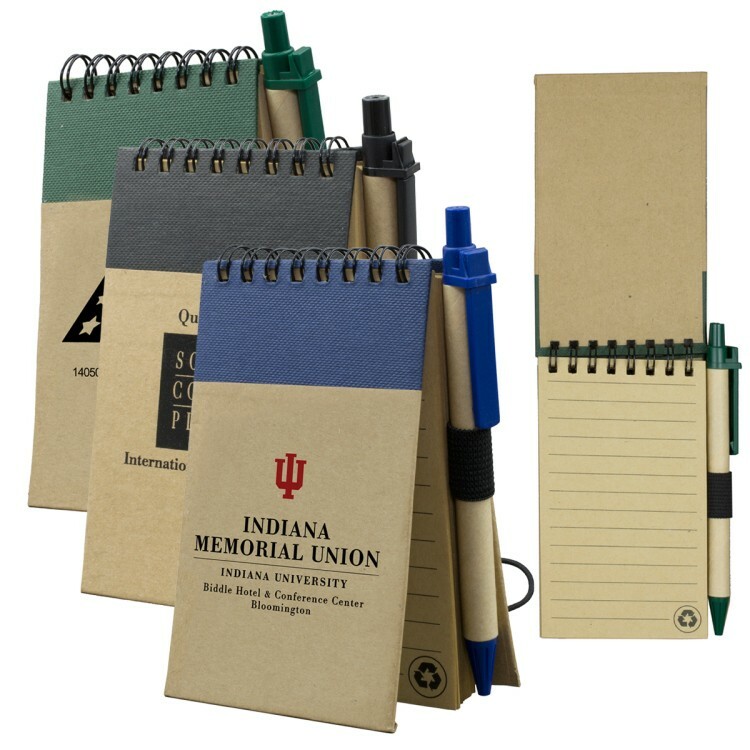 Elastic band allows for organization to hold smartphone and pen. 80 sheets of cream lined paper. Translucent colors. Extra hard plastic cover. Matching mini pen with retractable mechanism locks the cover. Release button on side of pen. Unlined paper with 80 sheets. 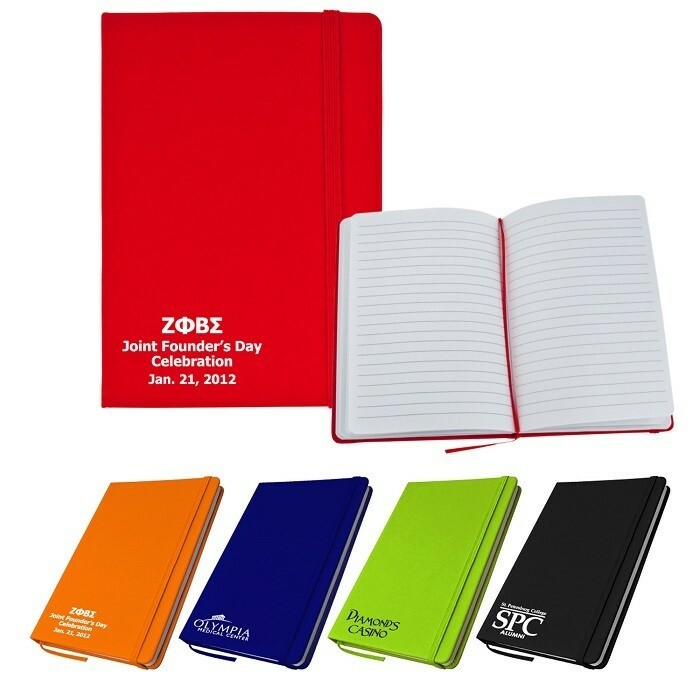 Actual size of jotter pad is 4-1/8"h x 3"w.
• 5 neon-colored flag strips made with recycled paper. 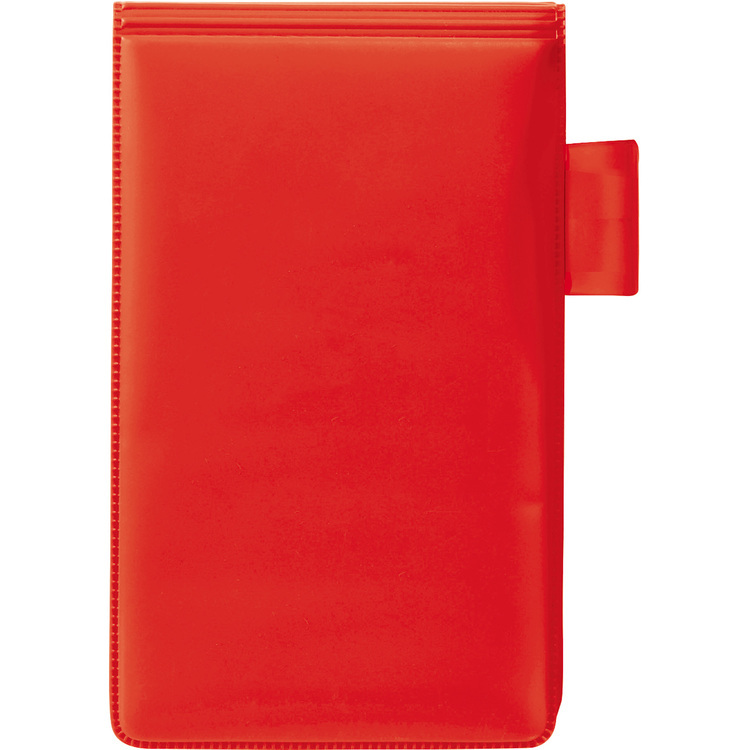 • Flap locks into slotted closure to securely keep the case closed. Compact and great for traveling. • Contains 25 yellow sticky notes (3”x 3”). • Comes with a heavy cardboard cover made from recycled paper. • Color stripe is made from recyclable, non woven material. 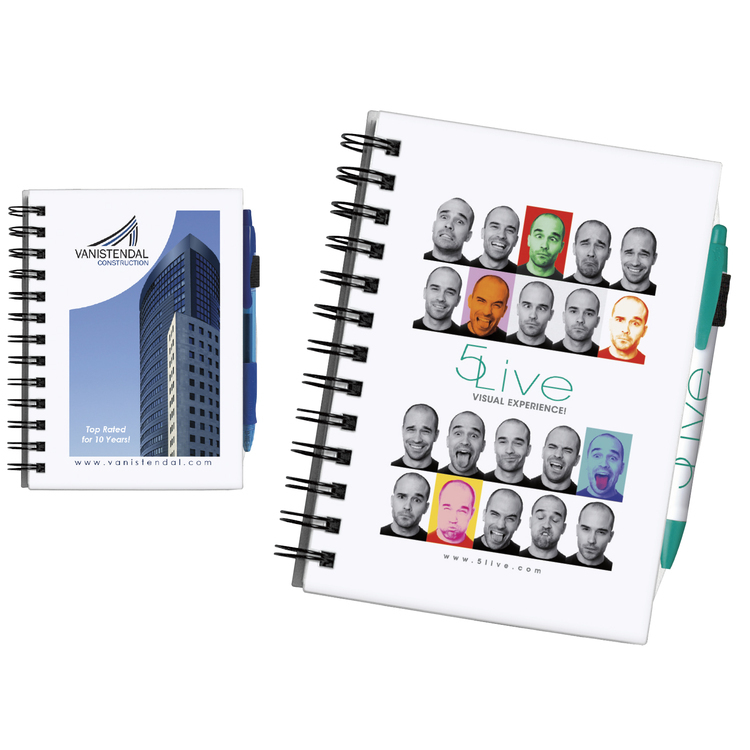 • Comes with 70 pages of recycled paper lined with soy ink. • Includes a black ink pen made from recycled paper. Great for office or personal use. 60 Page Lined Notebook. Polypropylene Cover. 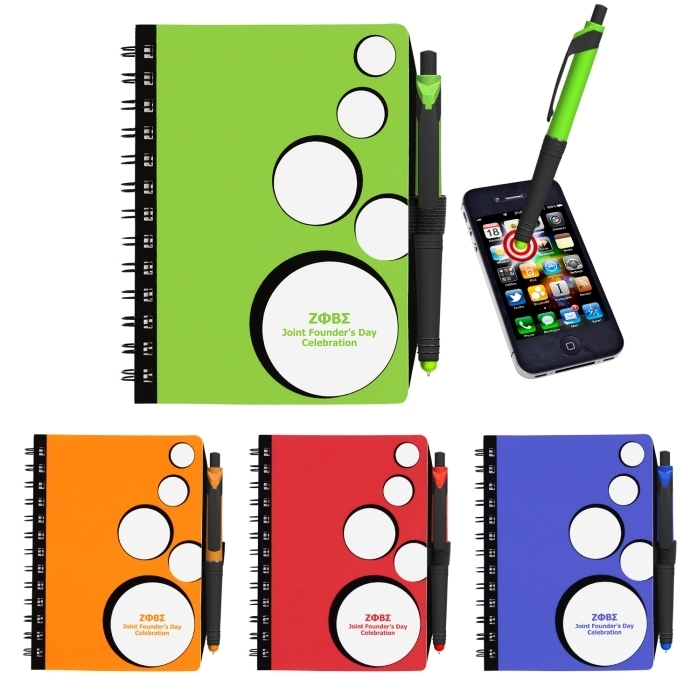 The outside skin of this notebook is made of a supersoft and smooth PVC material. 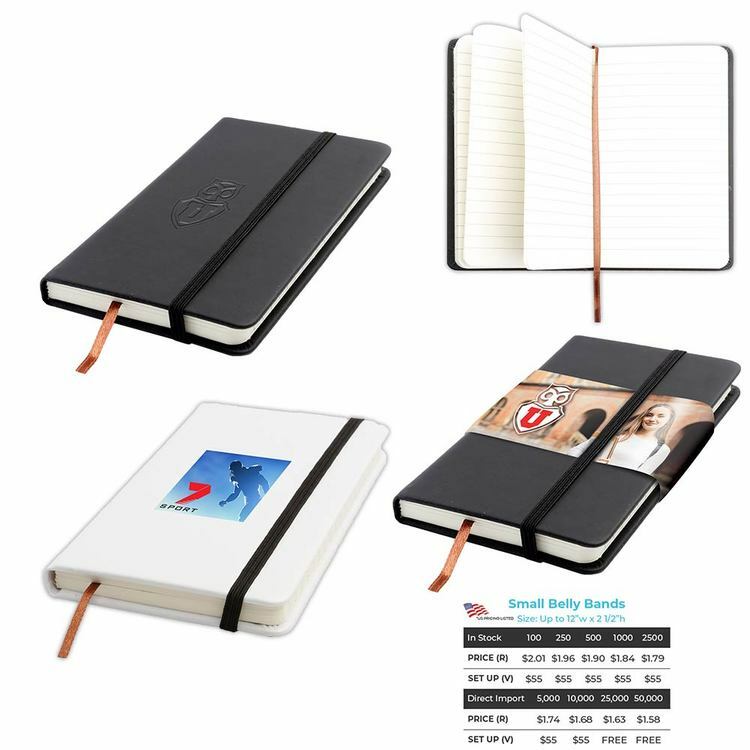 It has 80 pages of unlined notebook paper with matching color bookmark and stretchy closure strap.